The UK robot craft which saved seven Russian sailors stranded on the Pacific Ocean floor was operated by a civilian team used to tricky marine operations. The remote-controlled Scorpio 45 is operated for the Ministry of Defence by Cumbria-based firm James Fisher Rumic. Its "submarine rescue assets" are on standby to free stricken vessels, or to keep endangered subs supplied with air and other necessities until rescue. The craft, which started life in the oil industry, is based in Glasgow. The Russian submarine Priz had dropped to 190 metres (620ft) off the Kamchatka peninsula with seven crew on board. All escaped alive after the Scorpio craft sliced through nets entangling the submarine, stranded for three days beneath the Pacific Ocean. The Scorpio is about the size of a double bed, and carries cameras, sonar systems, propulsion systems, hydraulic power, electrical power, pumps, cutting equipment, and also has a manipulator arm. 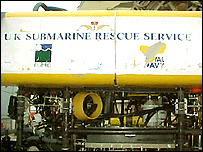 The unmanned craft is used in situations that are too dangerous or too deep to send divers. A team of nine went to the Pacific Ocean site - six operators, a naval architect and a liaison manager, as well as Ian Riches, head of the MoD's submarine rescue team. The team which was a mixture of Cumbrian and Scottish based staff. 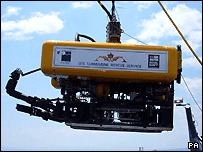 It can operate down to depth of 925m, with the depth being determined by the length of its umbilical cable. It is fitted with three cameras and cable cutting equipment to cut steel cable up to 70mm diameter. Speaking from the Rumic headquarters in Dalton-in-Furness, managing director Roger Chapman said that the Scorpio team the firm had sent to Russia was always kept at 12 hours notice for mobilisation. It also attended the scene of the stricken Russian submarine Kursk in 2000 but on that occasion was not given permission to intervene. "The Scorpio is a full-time submarine rescue vehicle - it can cut debris from the outside of submarines and also carry out inspections of exteriors," said Mr Chapman. "This operation was all about freeing a submarine. "After cutting away debris it can also lower 'life-support' canisters into the submarine's escape hatches." It can provide carbon dioxide absorption canisters, oxygen, food and drink and medical supplies. Mr Riches, head of the MoD's Submarine Escape and Rescue team, said the Scorpio 45 had "a world-class capability". As well as regular maintenance, the Scorpio has regular offshore trials onboard ministry and commercial vessels. The craft is located on the River Clyde, close to Glasgow International Airport. "It came originally from the North Sea oil industry, and has been adapted over the years. It carries up-to-date, state-of-the-art equipment," said Mr Chapman.